Smart Card Market is expected to reach USD 17.6 Billion by 2026 from USD 8.2 Billion in 2016 at a CAGR of 8.9%. This is a comprehensive global report focused on the current and future prospects of the smart cards market. This report is a consolidation of primary and secondary research, which provides market size, share, dynamics, and forecast for various segments and sub-segments considering the macro and microenvironmental factors. 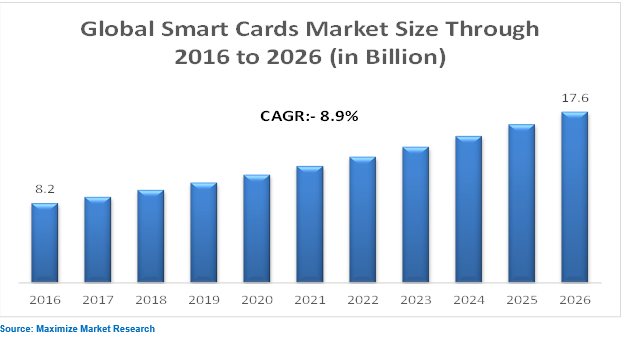 An in-depth analysis of past trends, future trends, demographics, technological advancements, and regulatory requirements for the smart card market has been done in order to calculate the growth rates for each segment and sub-segments. The growth of awareness about the smart cards among the small and medium enterprises is a major driver that is leading the market to grow at a swift growth rate. • Smart Card Market analysis and segmentation with respect to technology, application and geography. Global Out-of-band Authentication Market (OOB) : Global Industry Analysis and Forecast (2017-2026) by Solution Type, End-user, and by Geography. Europe Blockchain Market : Industry Analysis and Forecast (2017-2024) – by Provider, by Organization Size, by Application, by Industry Vertical, and by Geography.